A sales forecast is an essential part of a business plan. It is also essential if you are looking to get a bank loan or investors. Our free Sales Forecast Template lets you analyze and forecast the unit sales, growth rate, profit margin and gross profit for your products and services. It provides a quick starting point for setting up your sales forecast and includes some sample charts. This Excel spreadsheet lets you compare and analyze multiple products and services by enter monthly units sold, unit price and cost of goods sold (COGS). The template then calculates the total revenue, growth rate, margin per unit, and gross profit. Note: If your service is based on an hourly rate, you can enter the number of hours under Units Sold and the hourly rate under Unit Price. The final two columns compare the yearly totals for Year 2 vs Year 1 and Year 3 vs Year 2. In a business plan or presentation, you should probably use a chart to help communicate your forecast. We've included a few sample charts, both for the first year's data as well as all 3 years. Remember to use charts that effectively and accurately communicate your sales to lenders and investors. The spreadsheet was designed to let you print a couple different types of reports using the same worksheet. If you make significant changes to the template, you will probably need to make adjustments with the Page Break Preview, page scaling, or other Page Layout options. If you print the worksheet as-is, you will have each 12-month year on one page with the final page showing the yearly comparisons. For a Year-to-Year summary on 1 page, you can hide the columns containing the monthly data prior to printing. 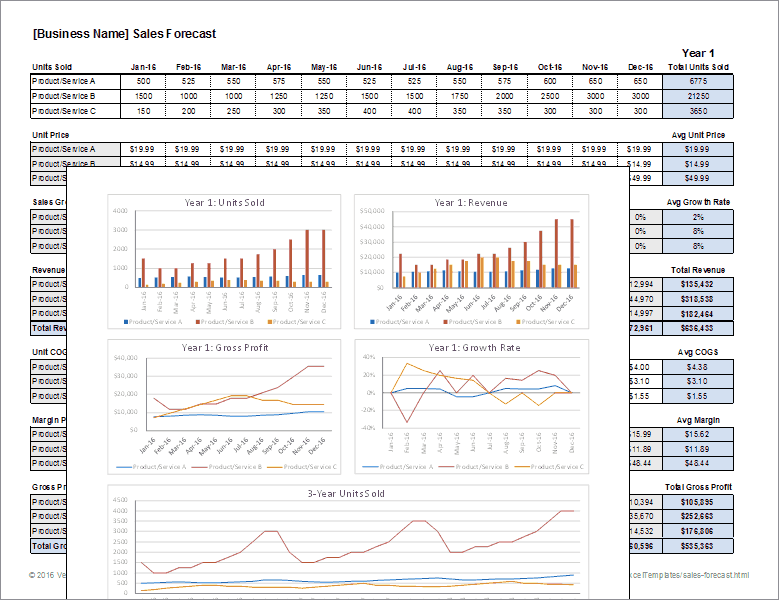 Financial Projections Template at score.org - An Excel Workbook that helps you see the potential of a business idea. If you are starting a new business, this can be a great resource because it combines a lot of important statements and projections into a single workbook. Financial Forecasting at TheStartUpPath at youtube.com - A great overview of the important details to consider when creating a sales forecast.